This is the final blog posting for RSP, as we have now suspended activities with the end of our current funding period on 31st July 2013. As the final post, it seems appropriate to review a little of what we have done. The Repositories Support Project (RSP) has been running since November 2006, funded by JISC as part of their strategic support for Open Access and repositories in UK Higher Education. During this time the RSP has run 93 events and 7 residential schools, attended by over 1,500 delegates from 257 different organizations. The RSP has hosted 16 webinars for over 1,000 delegates, of which 270 were international from the USA, Ireland, Lithuania, Spain, Portugal, Mexico, Argentina, South Africa, Canada, Nigeria, Italy, Germany and other locations. But of course our focus has been the UK. Within the UK, in addition to our face-to-face events, RSP staff have carried out nearly 100 consultancy visits to individual institutions; produced over 70 publications; maintained an active website, helpdesk and helpline; assisted UKCoRR, and taken the repository message out to stakeholders and policy makers in UK funding, research and Higher Education in committees, reports and conferences. A large number of staff have worked under the RSP banner over the years: Mike Hopkins, Bill Hines, Stuart Lewis, Jackie Knowles, Chris Yates, Hannah Payne, Liz Lyon, Rachel Heery, Maureen Pennock, Steph Taylor, Michael Day, Pete Cliff, Les Carr, Steve Hitchcock, Stephen Pinfield, Gareth Johnson, Mary Robinson, Sophia Jones, Rob Ingram, Peter Millington, Jane Smith, Dominic Tate, Emily Nimmo, Willow Fuchs, Laurian Williamson, Nancy Pontika, Emma Kilkelly, Jackie Wickham and me, Bill Hubbard. Our thanks to everyone and forgive me if I have missed anyone from the list! Thanks also to all of the external speakers, authors, consultants and experts that have contributed to RSP events, publications and advice. And of course, our thanks to JISC for funding the RSP over the years and their commitment and belief over the successive iterations of our activities; in particular to our JISC Programme Managers and others; Neil Jacobs, Amber Thomas, Andy MacGregor, David Flanders, Tom Franklin, Neil Grindley and Balviar Notay. Since we started, the number of repositories in the UK has tripled and the growth of the open access environment has allowed all the recent policy developments. This growth is due to the hard work and dedication of the repository advocates and administrators in each institution and I trust that the RSP has been useful to you in your work. As for the future – for repositories, certainly, the future is bright. The current moves with the RCUK policy and universities’ responses to this in balancing OA publishing and OA archiving; the eventual HEFCE policy towards repository access and REF 2020; the European initiative for OA to all funded work; Research Data Management and the promise of linking data to publications through – what else – the repository: all of these things mean that as a community we have significant work and significant gains to be made in the next few years. For the RSP, its events, publications and the support service – who knows! We have amended the website to allow it to stand as a resource for repository support and made the publications, podcasts, and materials available for re-use as well as listing the events and making available, where we can, the associated presentations for your use. As for direct support, there may be opportunities in the future if the community need is there for a support project. If you have individual needs, or need consultancy analysis and advice, then get in touch with us here at the CRC. The team here at the CRC in Nottingham will, of course, be continuing with other national and international projects and in providing SHERPA Services RoMEO, JULIET, OpenDOAR and FACT – so we will still be working with you. On behalf of all of the RSP team, my thanks to all of you that have been in touch with us in the past few days with thanks for our work and good wishes for the team: it has been very rewarding to hear how we have been valued. For now, good luck with your repositories! A new preservation guide has been released from the KRDS projects. This provides a useful four-page summary for management discussion, as well as the larger user guide, which includes the useful case studies from Southampton, Cambridge, Kings, Oxford, UK Data Archive and elsewhere – and the model itself. 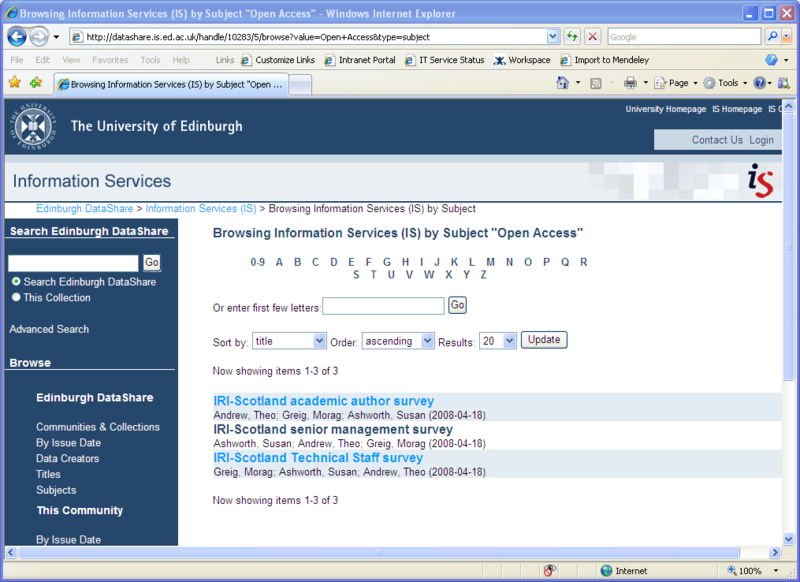 Readers may be interested to have a look at the DataShare service at Edinburgh University. This repository allows researchers to “deposit, share, and license their data resources for online discovery and use by others, either openly or in a controlled way if requested”. It arose out of a JISC funded project in the Repositories and Preservation Programme. I know from conversations that many repository managers are being approached by people in their institutions for help with storing datasets. It will be interesting to see how successful DataShare is in encouraging deposit. The survey on Scottish Witchcraft is intriguing! And for those working in/studying repositories the results of surveys of attitudes to open access and institutional repositories among academic authors, senior managers and technical staff would be useful. Preservation of digital materials has just come into sharp focus. An email I have just received on the ALA ScholCom list from Charles W. Bailey, well known as a digital scholarly communication expert, announces the deletion of an entire open access journal: The Public Access-Computer Systems Review. This journal ran over 9 years, got 4.2 million file requests and today, the University of Houston Libraries have deleted this open access journal from their website. Gone. They have also deleted archives of discussion lists, newsletters and more. Gone. And, significantly for the idea of preservation through laissez-faire duplication, it doesn’t look like anyone ever downloaded the archive of the journal, even though the copyright license allowed it. I do hope that some record for this comes out of the woodwork. The Internet Archive might have done something, but even their records can be partial and often just not there: we cannot outsource responsibilities like that. This is a shocking reminder of the need to formalise preservation and get protective policies in place . . .
Update: 3 hours later – the files have now been restored! Phew! Whatever else it demonstrates a fair degree of fragility: will someone now download and archive the content for a backup outside Houston?